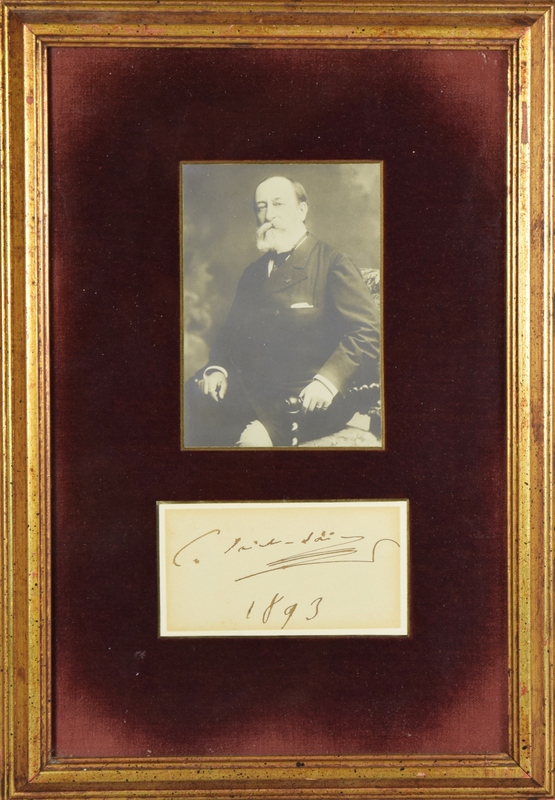 A large ink signature of Camille Saint-Saëns framed with a photo in a velvet burgundy and gold frame. Camille Saint-Saëns (9 October 1835 – 16 December 1921) was a French composer, organist, conductor and pianist of the Romantic era. His best-known works include Introduction and Rondo Capriccioso (1863), the Second Piano Concerto (1868), the First Cello Concerto (1872), Danse macabre (1874), the opera Samson and Delilah (1877), the Third Violin Concerto (1880), the Third ("Organ") Symphony (1886) and The Carnival of the Animals (1886).